London-born Benjamin Frankel was an interesting composer, one of several from the 20th century to have parallel careers in composition: he wrote much serious concert music, including symphonies, concertos, instrumental works of various kinds, and even an opera; and he composed numerous film scores. As it stands today, it is his film work that he will most likely be remembered for. The Man in the White Suit, The Importance of Being Ernest, The Night of the Iguana and The Battle of the Bulge were just a few of the better known films for which he composed memorable scores. The Curse of the Werewolf (1959) was another: it was one of a series of horror films produced by the British studio Hammer Films. Hammer became well known throughout England and the United States in the late-1950s and 1960s for producing better-than-average 'B' quality movies in the horror genre. The film starred Oliver Reed as Leon, who transforms into the title monster. 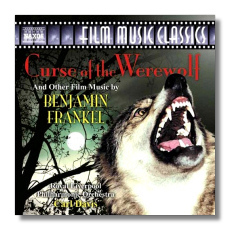 The score which Frankel provided for the film was historic in that it was the first for an English movie to feature almost entirely twelve-tone music. To be sure, it is generally quite approachable stuff in its austerity and often harsh dissonances. The best cues are probably the opening (Prelude) and closing (Finale) of the twelve offered here, which comprise the complete film score. As always, Frankel shows his deft ability at orchestration and instrumental color in the thirty-four minute score. This is surely one of his more imaginative efforts. The next two offerings, So Long at the Fair (1950) and The Net (1953), consist of one track each, both containing attractive, but much lighter music. The Prisoner is the other substantial score here, written for the 1955 Peter Glenville film depicting the imprisoning of a Roman Catholic priest (Alec Guinness) in an unspecified communist country, and his interrogation by an official (Jack Hawkins). The music is tense and atmospheric in its mostly restrained character, and subtle and psychologically penetrating in its darkness and probing character. This is just the kind of film music you wouldn't expect to hear on a commercial recording: it is substantive stuff, not glitzy or garish, not loud or percussive, but filled with intricacy and nuance in its mostly gentle but anguished character. Veteran composer-conductor Carl Davis draws fine performances from the Royal Liverpool Philharmonic Orchestra and Naxos provides excellent sound. For those listeners interested in superior film music, this disc is indispensable.